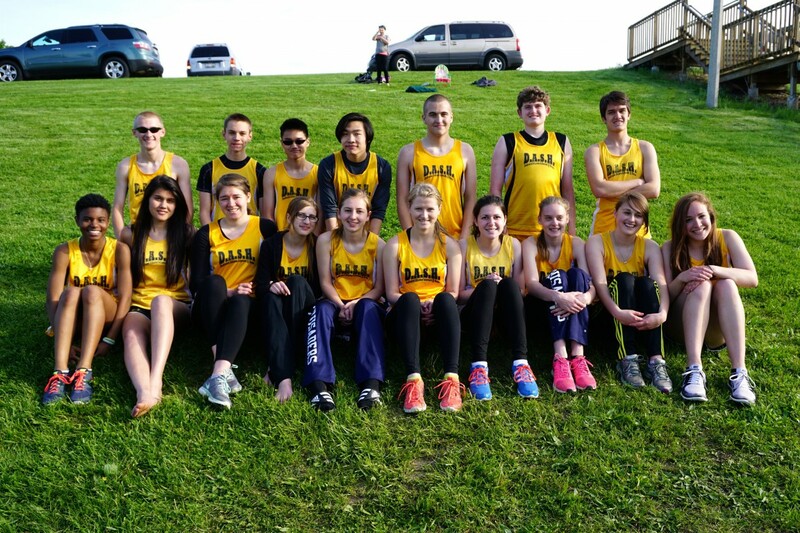 The middle school cross country team was up in Jackson yesterday to race in the annual WCHSA meet at Kettle Moraine Lutheran High School. This is mainly a small school meet, but it let a few big teams in a few years making it much more competitive. The weather was warm, but not too warm. It turned out to be a good day to race. Our promising, young 6th and under girls team would get the day started. Julianna Caspers has posted top-10 results here the last two years, and she would be looking to earn a top-3 medal this time out. Julianna came around the first turn in 10th place. And when she came back up the hill from the loop behind the track, she was still only running in 9th. On the back stretch of the soccer field Julianna started to make a charge. She headed for the finish line in 5th with all the girls ahead of her in sight. After some jockeying back and forth, Julianna had to settle for a 5th place finish this time, just five seconds out of 3rd. Her time was a very fast 11:06. Tune in next year when she gives it another try. We had plenty more excitement from the rest of our little girls. Grace Caspers and Savanna Bruton paced together most of the way. Then Grace made a bolt to the finish, passing up more girls than I could keep track of to finish 44th overall. Savanna had her best race of the season as well and placed 49th. Hellena Hacker, in just her first DASH race, kept Grace and Savanna in her sights the whole way. She had the DASH fans asking me who the fast new little girl was. Her 14:28 time was good for 51st. Zaela Schlissel ran another good race. If we can get her to run the latter half as well as her first she will really be moving up. Jenna Walters had a good day, giving us her best effort of the season. Anabel Fisher had a very nice start, but then struggled as most people do in their first race. She has the potential to be pretty good. Next in for us were Angela Walters and Mary LeSac. Mary struggled running with an extra pair of Julianna’s shoes. Her feet will be happier next time. Leif Kostrzewa was the boys 6th and under pacesetter. Leif went out fast and battled his way to our fastest time of the day, 10:42, earning himself the 16th place ribbon. Alexander Taylor had his racing face on from the start. Alex was our second runner in and is becoming one of our stars now. His 28th place ribbon impressed the coach. Salim Lubbad, Kaden Hacker and Seka Kostrzewa ran close to each other the whole way, keeping up a very quick pace. These guys have been ending up in a different order each race, and this time it was Salim who led the charge to the finish line, with all three boys cracking the top-40 and giving us five of the top-40 ribbons. Ben Breitbach had a breakout race and is really moving up. He showed off his speed at the end once again, and cracked the top-50. Joshua Lipski is like clockwork. He never seems to look tired and is giving us solid races each time out. Christian Loustaunau proved that his first race was no fluke with his nice run. Jacob LaBonte took at spill at the start, but got up and had his best race of the year. Micah Chan is now getting comfortable with distance running and he looked fast at the finish. Bryant Farrell gave us good effort once again. His times should start going down soon. Adam Loustaunau also took a spill at the start. It seemed to effect him more than Jacob. I will be working with him. Ethan Lindberg is slowly getting better with each race. Emma Taylor led Makenna Fisher through the first half of the course in the 7th and 8th grade girls race. Emma did not give us her best racing this time. I am pretty sure she is saving it for cooler day which I will remind her of this Saturday. Makenna slowed some in the second half of the race, but her 15:46 time was very respectable for a first race. Naomi Zhou moved up to finish right behind Makenna. Caleb Schaber went out fast and stayed with the top big guys for a long time. He fell off the pace a little near the end, but he is very close to really putting together a special race. His 10:52 time placed him 25th. Noah LaBonte stayed strong to the finish and has never looked better. He really got the coach excited with his 10:59 time. DASH veteran Joshua LeSac did not race as fast as he would have liked. It is encouraging that he is still pretty good now even when not at his best, and you never have to question his effort. Tikvah Schlissel put together a strong race from start to finish, and came in just ahead of Daniel Caspers. Daniel did not have his best. We will need him back running strong in the races ahead. Sean Seraphine ran better this time out, but is still finding the races long. We were missing a few of our top runners this time out, but with our depth we were able to stay very competitive in all but the 7th and 8th grade girls race. Almost all of the athletes are putting out great effort. I know they are competing with each other, as well as with the other teams, and that is what is needed for us to keep improving. We have two more races coming up soon, and then a small tune up race before the Homeschool Championship. This is the part of the season we have been training for. Thanks to Mr. Beck for his help with the coaching. Thanks to Faith Caspers, Hillery Farrell, and anyone else who helped pass out the bib numbers. Thanks to Andrea Beck for collecting the cards at the end of the chute. Thanks to the parents who made the trip to Jackson and gave the athletes a chance to race. And thanks to the camera lady for once again getting the photos. We are in the busy part of the season now. Let’s stay healthy and be ready. 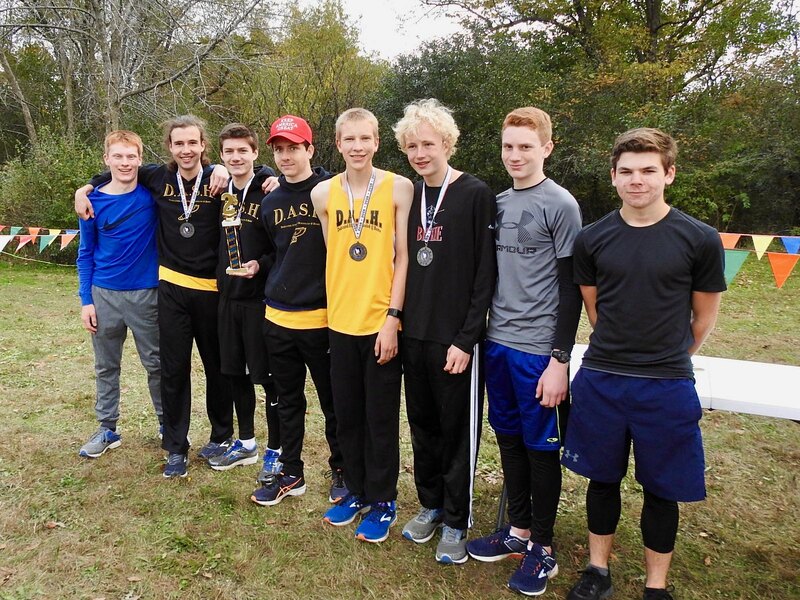 The high school cross country team was back in action last Saturday at Mitchell Park competing in the annual Trojan Invite hosted by Bradley Tech. The team had a 15 day break in their schedule to get in some tough mid-season workouts. Now it would be time to put our paces to the test, and see if we are ready to finish the season strong. The JV race was first on the schedule. John LaBonte showed us how much he has improved since our last meet, running out with the leaders and eventually putting them all behind him. John’s 20:05 time was amazing considering he was not getting pushed at the end. John Klaves came in soon after to earn the 3rd place ribbon. We already have a couple guys named John running varsity. We are close to having two more. Ben Hughes has really become a runner now. He had a great last mile and finished 9th overall. Lucas Ebel donned DASH yellow for the first time and stayed with Ben for most of the way. In a couple weeks he will be one to watch. Joshua Anumolu looked much more confident this time out, and battled his way to the team’s fifth JV ribbon by finishing 17th. Will Farrell keeps getting better with each race. I expect to see his times to keep coming down. Joshua Schaber did not look as good as he did in Mayville, but morning races can do that. Katrina Lipski ran a very smart race and was rewarded with the 9th place ribbon. Margaret Mary Serchen ran well at times, but struggled at others in her first DASH race. In the end, she was fast enough to get the 15th place ribbon. 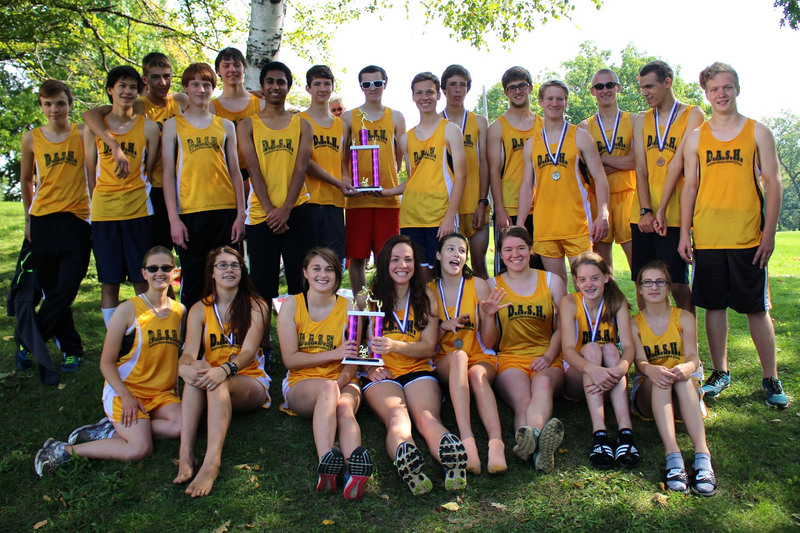 The varsity girls placed 2nd overall to Rufus King last year at this meet. This year they were hoping to move up one more spot. Andrea Beck assumed the lead early and paced about eight steps ahead of a freshman Dominican athlete. Andrea went on to cross the finish line first by 15 seconds to claim her second victory in a row at this meet. Faith Caspers paced the rest of our girls through the course. Kayla Walters, Kayla Bruton, and Jessy Homa lined up behind Faith, and kept the team race with Rufus King very close for the first two miles. In the end, Rufus King proved too strong for us, but it was good to see us working hard and giving them a race. Faith Caspers held on for a 10th place finish, with Kayla Walters and Kayla Bruton sprinting in to finish right behind her. Jessy Homa just missed out on the top-15 medals with her 17th place finish. Five of the top 17 girls was not quite good enough this year. Next year we will try again. Zipporah Caspers made it through the course, but is not running at 100% right now. Hopefully she will be running easier soon. Renee Walters arrived too late for the JV race, so she lined up with the varsity runners and gave it a go. Her time was about what it should be with how much she has practiced. It was a good workout for one of our track MVP’s. The boys were looking to defend their first place trophy from last year, and were heavy favorites to do it again despite not having Justin Chu on hand. Jacob Dickman made it back-to-back victories on the Mitchell Park course. Jacob won by over a minute as he found no worthy challenger to try and stay with him. Joe Hughes and Drake Hacker both stayed in the top-10 from start to finish and ended up in 7th and 8th place. Joe is running where we expect him to be right now, and Drake, just a freshman, is running better for us than we could have ever hoped. It looks like he will be staying in our top-5. John Kowalinski kept getting stronger throughout, and moved all the way up to 13th place at the finish. John is peaking at the right time. Samuel Zinkgraf finished just five seconds out of the top-15 medals with his strong effort. That gave us five boys in the top 18 which was too much for our competition, The 1st place trophy would be ours, but the race was much closer than last year. Joe Maurer also had his best race to date. He always saves his best racing for the end and he finished just 4 spots behind Samuel. Timothy Kowalinski did not fare as well this time. I am sure he will be determined to run strong the next time out. John Sherman felt the effects of the heat, and the cold he is just getting over. Expect John to post some good times as the temperature drops in the coming weeks. We ended up with 2 team trophies, 8 top-15 medals, and 7 top-20 JV ribbons. We certainly took more than our fair share of awards, yet I don’t think we will look back when the season is over and think we did our best racing here. Our next three meets will be very competitive, and we will need to be at our best to come out on top. I have a feeling this team is rounding into top form just in time. We will find out soon. You will not want to miss it! Thanks to Mary Beck, with the help of Ed Beck, for taking the official scores. Thanks to all the DASH fans who lined the course in different spots to help keep the athletes going. The athletes did take notice. Thanks to all the parents who somehow made their way to the park despite all the road closures. Thanks to the picture people, Grace Zingraf, my wife, the photographer behind Andrea’s camera, and also myself. The photos captured most of the action, and it took a lot of running around to get them. It will require much less running around for the DASH fans to catch the action this Thursday for the big meet in Racine. I hope to see you there. Our exciting middle school cross country team was in Elkhorn on Wednesday competing in one of my favorite meets, the Elkhorn Invitational. There were only six starting boxes, but with the very good Elkhorn and Waterford teams filling two of them, our competition would be stiff. This is the last of our early season meets. It gives us another chance to see how the team is progressing and what we need to work on, with the goal of peaking at our big championship meet ahead. Our very young 7th and under girls team would get the DASH fans attention first. Julianna Caspers went out fast and stayed fast. Julianna was running 14th at the half mile point, and then methodically started moving up until she found herself in a race for 8th place at the finish. Her amazing 10:48 time would earn her a spot on the medal stand. Stephanie Chu started off much slower this time, but she was also able to move up near the end and capture the 14th place medal. Grace Caspers kicked it in at about the mile mark and caught up to the very steady Julia Kowalinski. Grace and Julia hit the homestretch together with Grace coming in just ahead. Zaela Schlissel got off to a great start in her first race. She found the going a little more difficult later on, but hung on for a 38th place finish. Yes, that gave us four 3rd graders in the top-38. 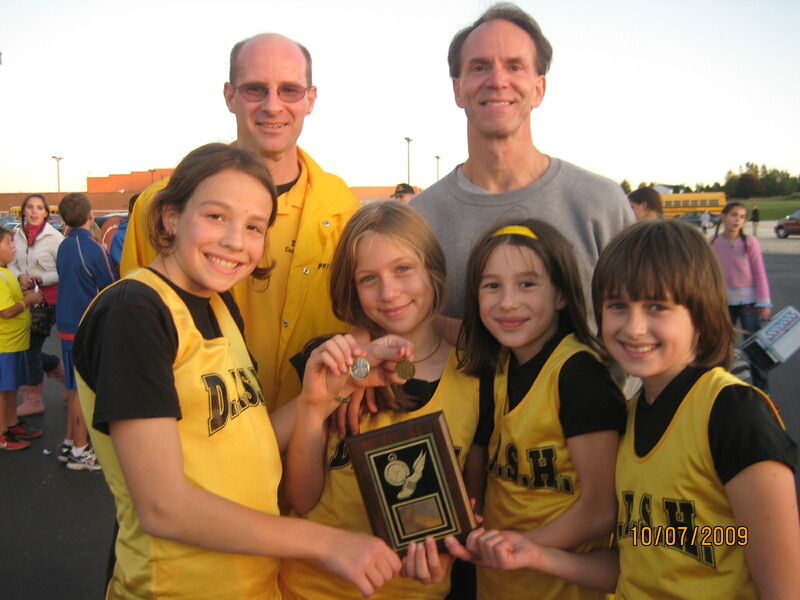 The vision of these girls racing in a few years is hard to keep under wraps. Angela Walters stayed ahead of sister Jenna this time with both girls showing improvement. Mary LeSac made her season debut with a solid effort. We had eighteen 7th and under boys lined up to race next. Jeffrey Breiling, Leif Kostrzewa, and Joshua LeSac ran together until about the half way point. Then Jeffrey pulled away and never let up for a hard fought 9th place finish and a nice 10:05 time. Leif finished just 12 seconds back which was just fast enough to get the 15th place medal. Daniel Caspers gave it all he had the last half of the race and finished a step behind Joshua LeSac. Joshua and Daniel were both shooting for medals, and just missed with their 18th and 19th place showings. Kaden Hacker followed Daniel through the course early, and stayed steady to the finish, where he was getting pushed by Nathanael Chu. Nathanael had been striding with Alexander Taylor until taking off to catch Kaden. Kaden, Nathanael, and Alexander finished 25th, 26th, and 28th. That gave us 7 of the top 28 spots. These boys are running close, so don’t expect them to finish in the same order next race. Seka Kostrzewa was back turning heads. The surges he puts on during a race really frustrate the bigger kids. Seka finished 40th overall and was followed by Tikvah Schlissel. Tikvah is still learning how to pace himself. Expect him to be up with some of our top guys next time out. Joshua Lipski proved his vast improvement is no fluke. He posted a very nice 12:10. Matthew Kowalinski may have been our most improved runner as he stayed with Joshua for most of the way. Ben Breitbach had an inspiring finish and was also much improved. Micah Chan ran steady and posted a good time. He still looks a little uncomfortable out there. A few more races should fix that. Christian Loustaunau ran better than I thought he would in his first race. Well done. Jacob LaBonte was happy with his time. He is gaining confidence now. Adam Loustaunau needs to smooth out his running. Once he does that he will be moving up. Bryant Farrell got through his third race. It is becoming routine for him now. Ethan Lindberg ran much better his second time out, and I think he beat someone. 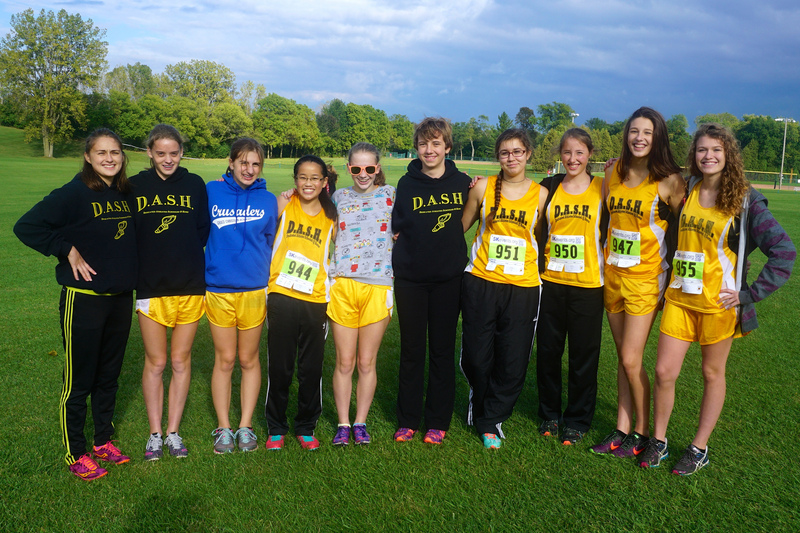 DASH star Rebecca Dickman joined our 8th grade girls, giving us four at the start. Rebecca got out fast and stayed in the top-6 the whole way. Rebecca moved herself up into 5th place by the finish to give us another athlete to cheer for at the award ceremony. Emma Taylor had her best race to date. She had a strong start, found some girls she could run with, and then kept them behind her to the end to place 16th. Naomi Zhou posted another respectable time, and Sarah Lindberg struggled in her first race of the year. Practice time awaits. 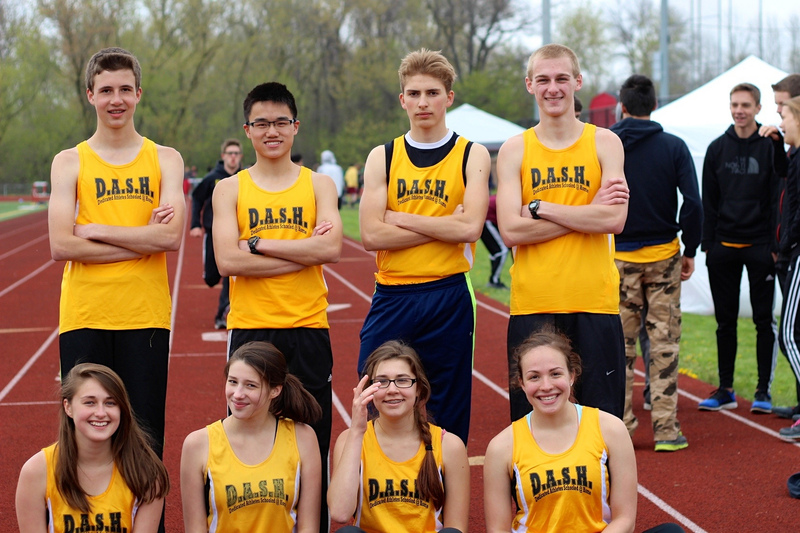 We were only able to line up three 8th graders, but they all ran well. Vincent Maurer ran like a star again. He stayed with the four other really fast guys the whole way leaving one behind him at the finish. His 9:32 time was what was needed to get the 4th place medal. Caleb Schaber ran with the top-10 guys for a long while before settling for 14th place. His 10:13 is good, and he is close to becoming really good. Noah LaBonte cut off almost three minutes from his time on this course two years ago. He’s racing now. This team is already pretty good. Now with the meets coming up fast, we will not have to wait long to see how good this team ends up. 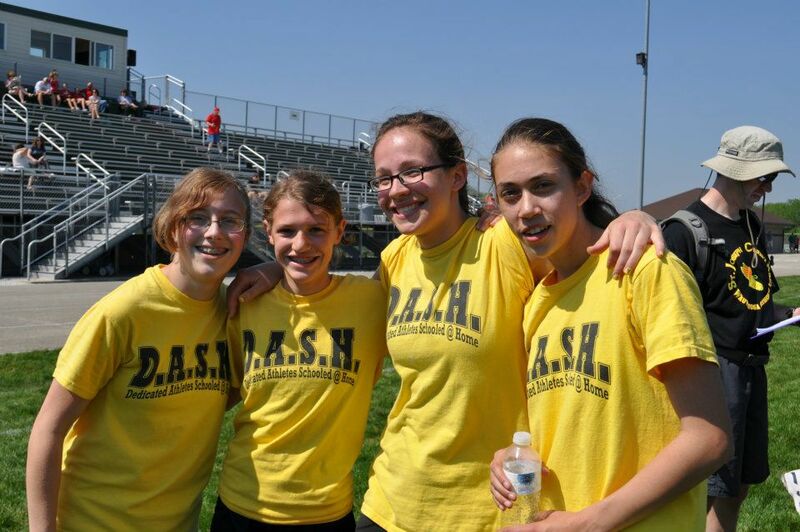 Adding in the high school races, the DASH fans will be in for plenty of excitement in the next three weeks. We have to stay ready, stay healthy, and get in some good workouts between meets. It is going to be a challenge, it is going to be exhausting, and it is going to be fun. You will not want to miss it. 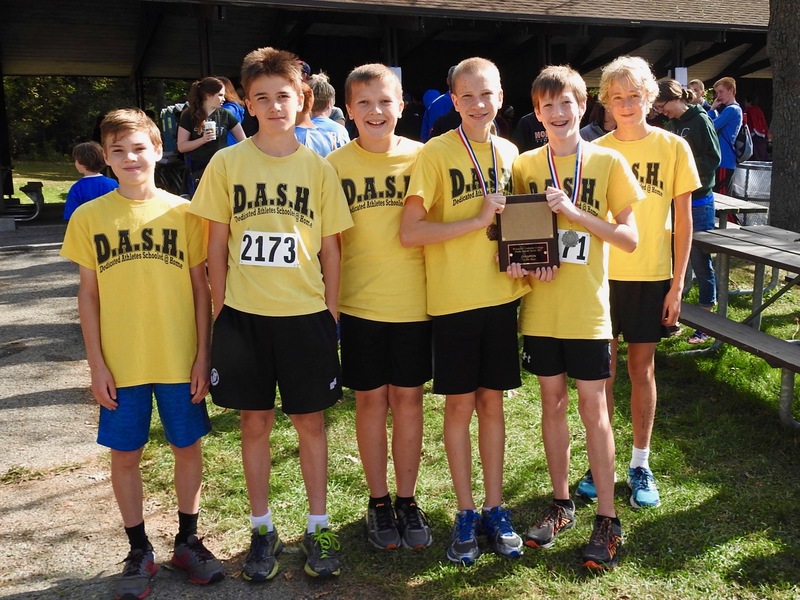 The 2015 DASH middle school cross country team was on full display for the first time yesterday at Lake Denoon Middle School in Muskego. 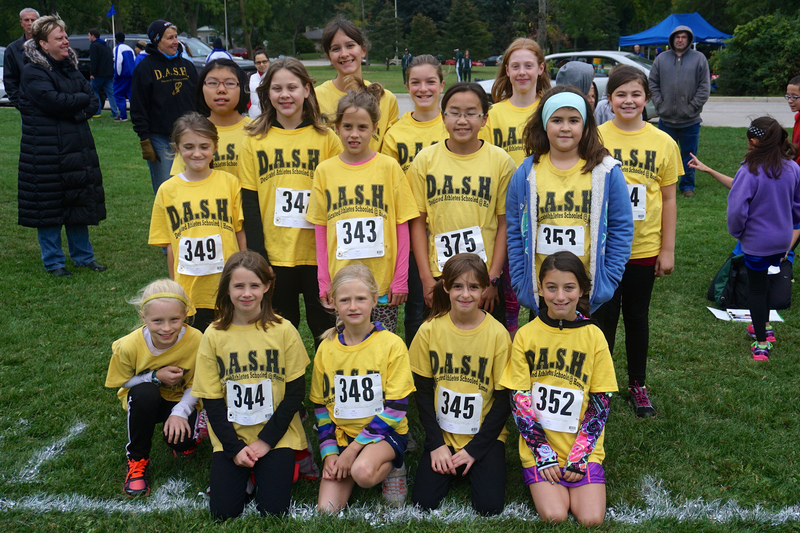 Unfortunately, we did have a few athletes miss their start because of traffic and parking issues, but we still had 33 athletes donning DASH yellow, ready to compete against a field of more than 900 athletes. We now know how we stack up against some of the biggest teams in the area, and I think the DASH fans were happy with what transpired. The 7th and under girls got the day started. Stephanie Chu raced to the front early with Julianna Caspers giving chase. Julianna eventually got ahead of Stephanie, and then the girls stayed close the rest of the way with Julianna earning the 36th place ribbon, and Stephanie the 43rd. It was good to see Stephanie staying up with Julianna and have two girls in the top-50. Third grader Julia Kowalinski had a great first race, finishing in the top half. Another of our amazing 3rd graders was next. Grace Caspers kept up a nice steady pace in her first race at Lake Denoon. Savanna Bruton ran well again and finished with a respectable 16:24 time. The Walters girls showed us why practicing hard is important as Jenna and Angela both finished in the 18 minute range. They have the coach’s attention. 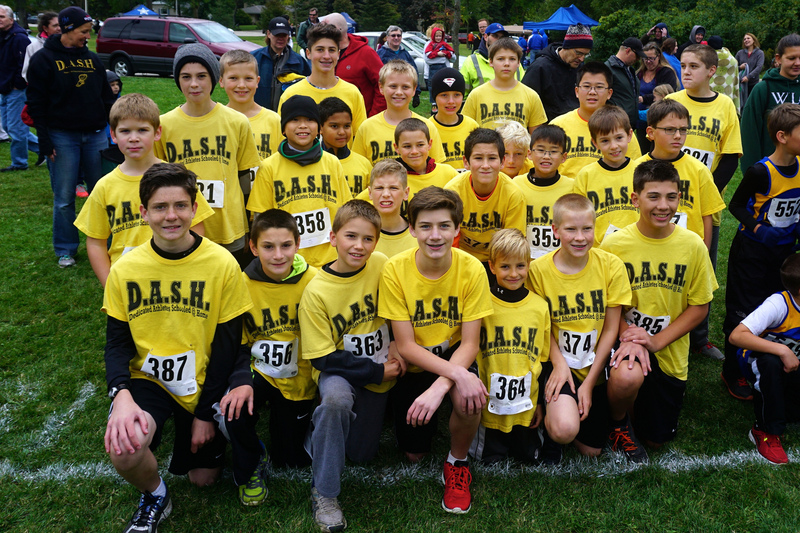 We ran 17 athletes in the 7th and under boys race, a DASH record. Believe it or not, that is the average team size at this meet, so it may be a little too soon to call us a big team while running here. 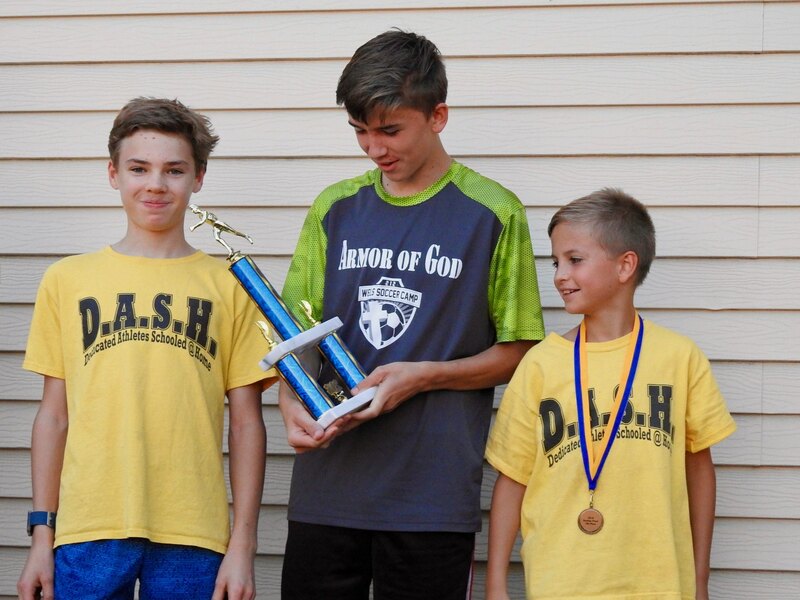 Leif Kostrzewa led the DASH boys from the start. Leif cracked the top-50 for the first time at this meet. It took a fast time of 11:20 to earn the 36th place ribbon. Joshua LeSac kept Leif in his site the whole way. His hard work through the years is paying off. Alexander Taylor, in just his first DASH race, broke 12 minutes and looked especially good at the end. I get excited just thinking about how good he has gotten in such a short time. Jeffrey Breiling cracked the top-100 despite not running his best. His best races are coming up. Kaden Hacker also inched his way into the top-100 with a great finish. He is new to the DASH team this year and will be very good. Daniel Caspers is running much better right now, and will be looking to stay up with our top athletes this year. Nathanael Chu was turning heads with his performance. He is deceptively fast, and never tires. Salim Lubbad kept his time under 13 minutes. He faded some in the second half of the race, but will be one to watch as the season goes on. Seka Kostrzewa was slowed by a bad choice of running shorts. He is the youngest member of the team, but always stays with the big guys. Joshua Lipski rounded out our top-10. He is turning into a very good runner. There was over a minute gap after Joshua before the rest of our team finished up. These are our more inexperienced athletes that we will want to keep our eyes on to see who it will be that puts in the work and starts getting really fast. Ben Breitbach showed the most promise coming in with a 15:12 time. Micah Chan was just 5 seconds behind Ben and had a great finish. Bryant Farrell proved his first race in Mayville was no fluke. He is moving up. Matthew Kowalinski got out fast, but then had troubles. Jacob LaBonte was not at his best. He will be better in the meets coming up. Jose Rosario toughed out his first race, and Ethan Lindberg enjoyed his race despite being in the back. The boys team is big, and hopefully this report will help the DASH fans sort them all out. There is a lot of talent here, and the boys natural competitiveness will hopefully have them running faster each meet. We fielded two 8th grade girls. Emma Taylor paced her way through her first cross country race until the end where she showed off her speed with a spectacular finish. It especially impressed Mr. Beck. Naomi Zhou has been looking good in practice. Naomi stayed steady throughout, but her racing here will not end up being her best. We ended up with seven athletes in the 8th grade boys race. Vincent Mauer proved he is our number 1 guy this year. 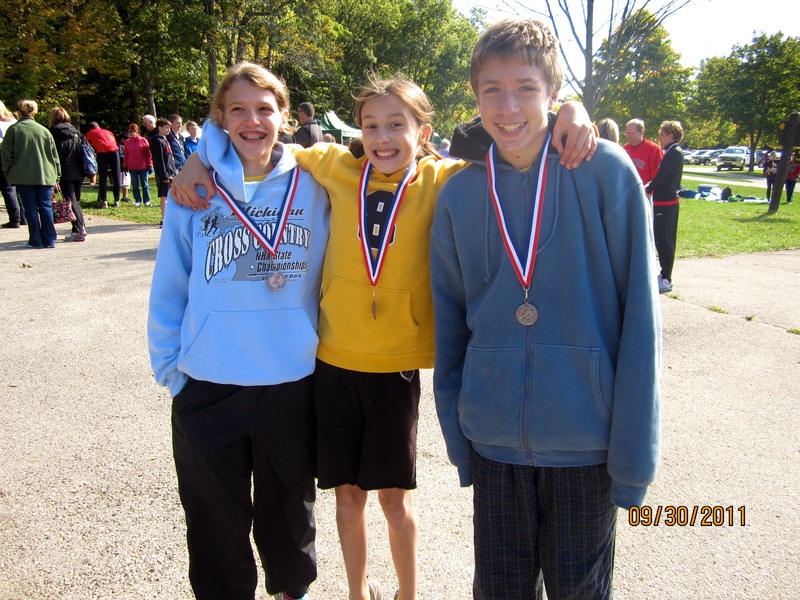 His 10:06 time earned himself the 9th place medal and a date at the award ceremony. Caleb Schaber looked good as he raced to an 11:43 time, good for 59th place. 7th grader Tikvah Schlissel was in the 8th grade race because of traffic issues, and posted a very good time coming off of a recent foot injury. 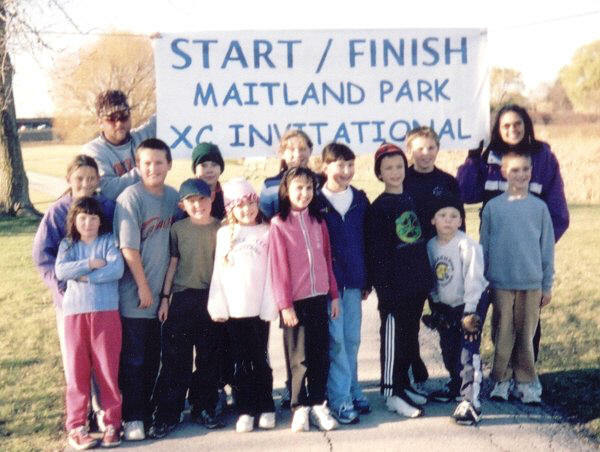 His time would have put him running with a big group of our fast 7th and under boys. Noah LaBonte has never run as well as he did yesterday. He is obviously working hard. Luis Rosario ran a strong first race. Peter Chan also ran well. He is a fan favorite. Sean Seraphine worked hard, and had a good finish to his first race. Thanks to Mr. Beck and Zipporah Caspers for getting the times. Thanks to Faith Caspers, Kayla Walters, and Katrina Lipski for collecting the cards. Thanks to Drake Hacker, Will Farrell, and Joshua Schaber for helping get the boys to the start which has been a problem for me in the past. Thanks to the parents for getting the athletes to the race. Sorry about the parking for those who arrived a little late. And thanks to the camera lady for getting the photos. This meet has gotten so big, yet everything ran very smooth this time. The season is becoming a lot of fun, and next week we get to do it again in a smaller race setting. I hope to see you there. 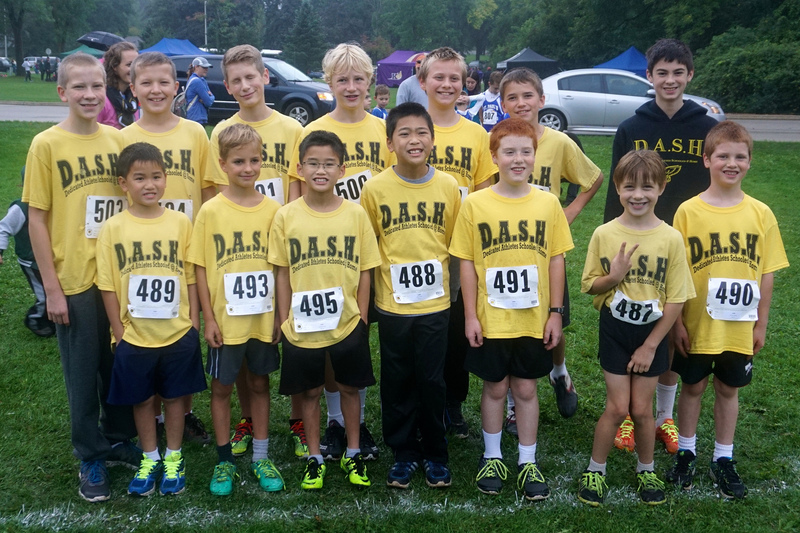 The DASH cross country team competed in Mayville last Friday. 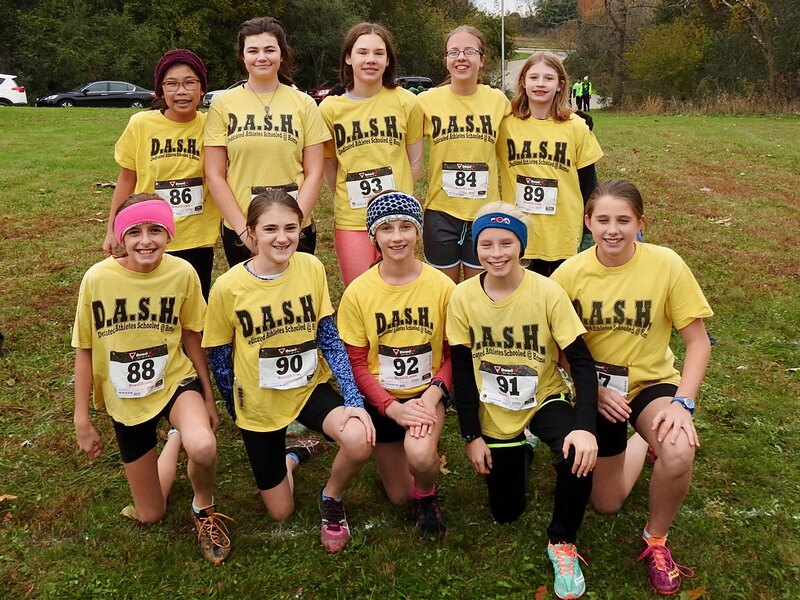 It would be our first chance to see some of our exciting middle school athletes, and we would get to see our high school team run on a faster course in cooler conditions. Over 800 athletes total would be crossing the finish line, so we would have to be at our best to post the results we were looking for. The middle school team, both boys and girls, got to the starting line first. 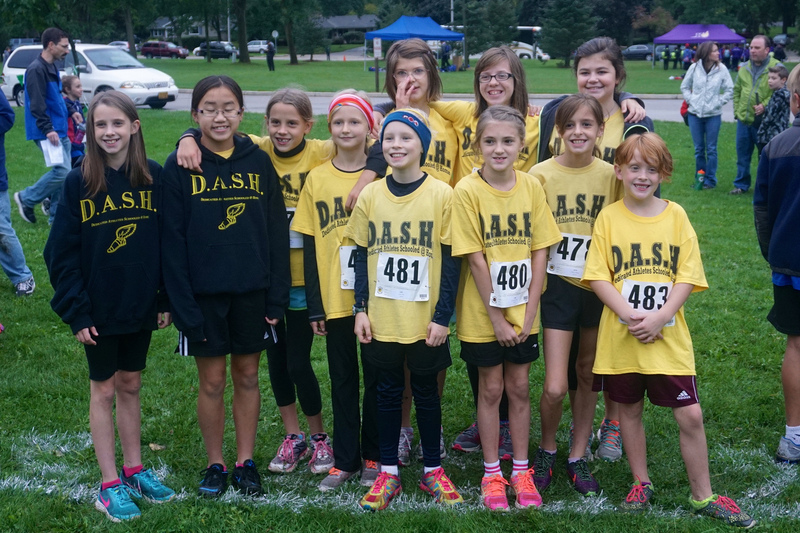 Eleven boys and five girls wearing DASH yellow came out of box 17. DASH newcomer Vincent Mauer led our boys through the course, posting an impressive 13:38 time. Leif Kostrzewa and Joshua LeSac stuck together until the end with Leif coming in a fraction of a second ahead. Caleb Schaber looked good in his first DASH race. Caleb was followed by Daniel Caspers who also ran well. Three of our youngest competitors put on quite a display of racing. Seka Kostrzewa got ahead of Julianna Caspers and Nathanael Chu midway through the race and would not be passed. Julianna finished just ahead of Nathanael with all of them finishing in the 15:20’s. Rebecca Dickman started strong, but wasn’t right this time out, and faded down the stretch. Noah LaBonte is back with the team this year and gave us a good first race. Stephanie Chu was our third girl in. She will be one of our better runners this year. Joshua Lipski is much improved from last year, and it showed as he finished in 16:52. Savanna Bruton was not slowed by the long race and did very well in her first race. Ed Sherman’s training has been slowed by a concussion. He will be better later in the year. Bryant Farrell clearly enjoyed the long race and will only improve as the season goes along. Naomi Zhou made it to the line just in time and gave us a good finish. The middle school team is not in mid-season form yet, and we ran only about a third of the team, but the team is clearly much improved. 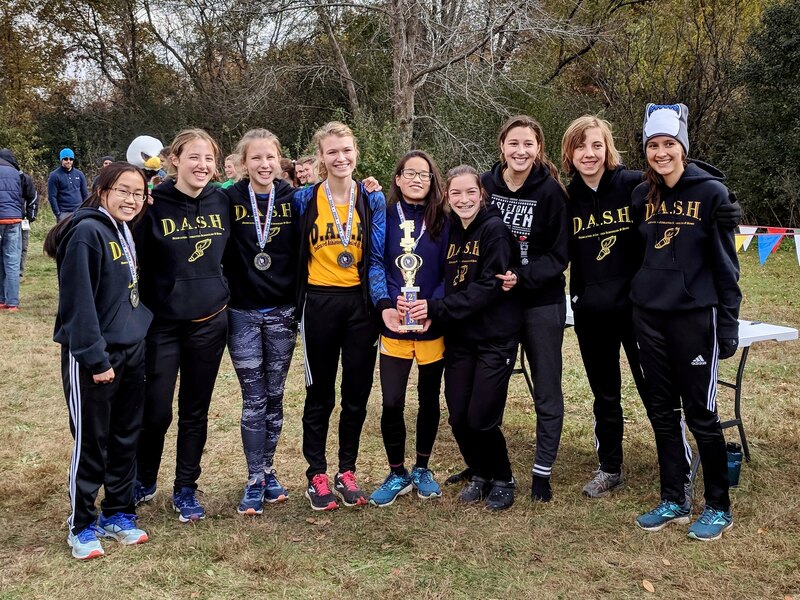 The high school girls team has been improving with each meet, and this was the day that everyone ran to their potential. Andrea Beck was back and was able to lower her time to 23:03. The goal is to to get the rest of the varsity girls’ times much closer to Andrea’s, and we were much improved in that area. Faith Caspers got out much faster this time and held her pace to the end to finish with a nice 24:17. Abby Chu kept Faith in her sight the whole way and posted a 24:20. Kayla Bruton moved up as the race went along and also went under 25 minutes with a 24:37. Kayla Walters just missed getting under 25 minutes by 5 seconds. Expect her to stay up near Faith and Abby in the future. That is what we will need from our girls as we start thinking about our homeschool championship meet just six weeks ahead. The good times did not stop there. Jessy Homa outkicked Zipporah Caspers when the finish line was in site, with both girls finishing in the low 26’s. Katrina Lipski cut off about 2 minutes from her first 5k race, giving us great results from all the girls. This team will end up very good. Time will tell just how good. Twelve of our high school boys made the start. Jacob Dickman cracked the top-10 once again, this time coming in in 9th place with a 17:41 time. Justin Chu was not far behind Jacob after posting a personal best 18:14 time, good for 17th place. Joe Hughes has his time down to 19:02 as he continues to round into top form. Like he has done so many times before, Samuel Zinkgraf came through with a big race when we really needed it. Samuel moved up in the last mile to post a very nice 20:05 time and was our 4th runner in. Seniors John Sherman and John Kowalinski strided together the whole way, with John Sherman finishing just ahead. Joe Maurer completed our varsity team, finishing two spots behind John Kowalinski with his 20:46 time. We still had five more athletes to come which would comprise our JV team score. Timothy Kowalinski and John Klaves both ran hard, and gave us two more athletes under 21 minutes. John LaBonte came in with an impressive 21:04 time. That gave us seven athletes just 59 seconds apart. This team is very deep. Will Farrell got his time all the way down to 24:08. Will is running with much more confidence now. Joshua Schaber stayed steady until the end and also edged under 25 minutes. 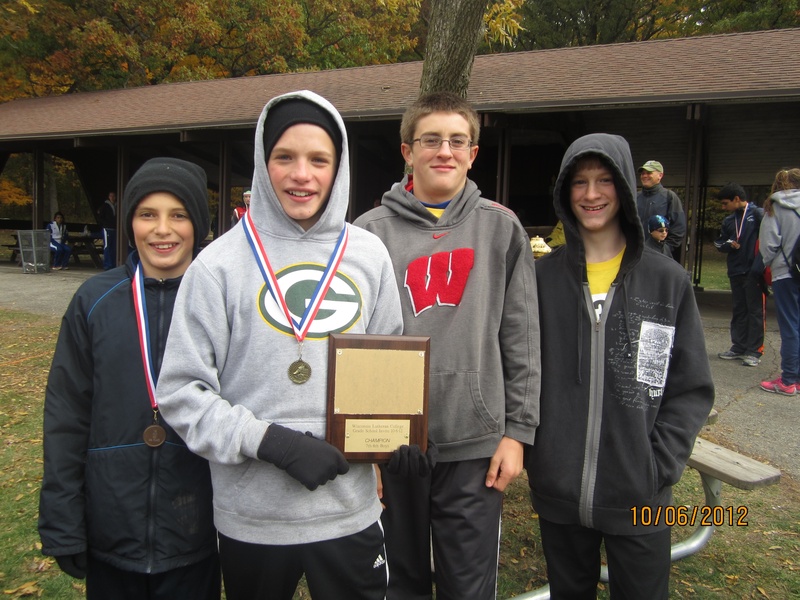 Our JV boys would finish 3rd overall. Our varsity team placed 6th out of 17 teams. Those were very good scores. Our boys will be tough to beat at our smaller meets ahead. The high school team is really meeting expectations at this point in the season. Now we have two weeks between meets to work on our fitness, and be ready for our big meets ahead. Our times have been good, but we will need to get them even lower in the next six weeks to make this a championship caliber season. I am excited about it. I hope you are too! Thanks to all who made the long drive to Mayville. I may look for a closer meet next year. We will see. Thanks to Ed and Mary Beck for getting times at the finish, and thanks to the people who helped me collect the cards. Fortunately, there were no issues with the scoring system, but we were ready just in case. Thanks to Ed Beck and Chuck Maurer for getting the mile splits. Thanks to Grace Zinkgraf, who was our photographer once again. You will definitely want to check out the photos to see how good we looked, and how much fun we had running this fast. 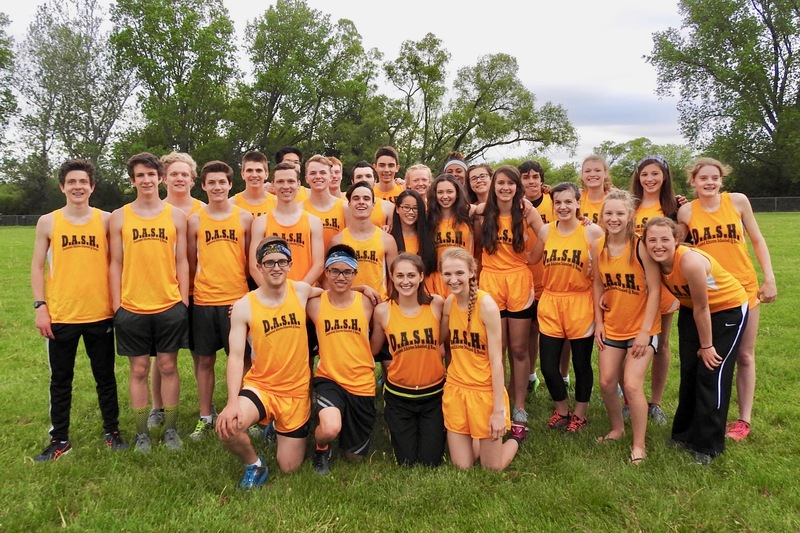 Our high school cross country team was found at Minooka Park yesterday morning, competing in the Blackshirt Challenge hosted by Waukesha South. 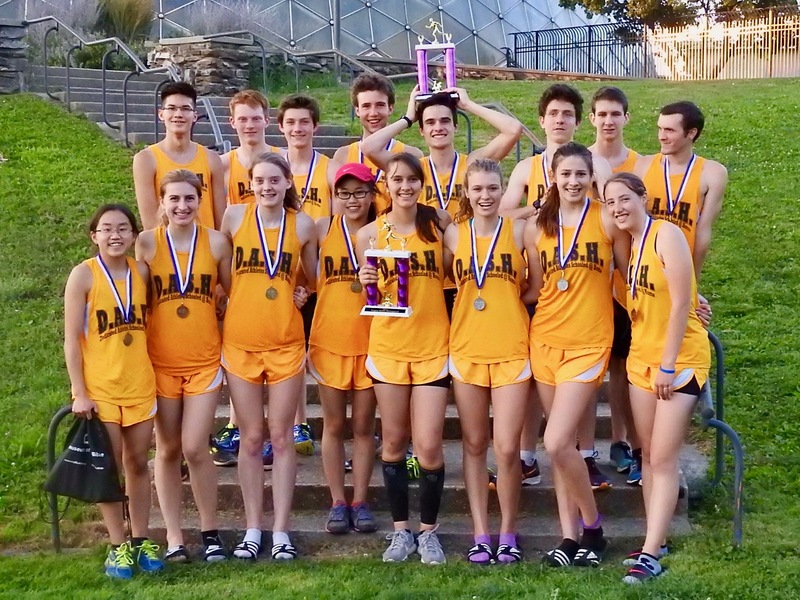 We have participated in this meet for as long as we have had a high school team with mixed success. The course is tough, and yesterday gave us warm and especially humid weather to compete in. We would be bringing our biggest boys team ever. Seventeen DASH boys would be coming out of box 1, followed by six DASH girls running a 4k. Nineteen other teams were on hand, many of them division 1. It would be a great early test to see how we stack up against some very good competition. I ran the back trails just fast enough to see the lead cart coming through at about the 2/3 mile point. Coming in right behind the cart were DASH newcomer Henry Chapman and longtime DASH star Jacob Dickman, both running in the lead pack. My excitement grew as more and more DASH yellow passed me by, all holding down very good positions. The boys were on pace to have a special day, but it was still very early with plenty of hilly terrain ahead. At the next viewing area at about the half way point, our boys were all still holding down their spots. With Henry and Jacob still running in the lead pack of three, we were definitely becoming the talk of the race. It was now time for me to head to the big hill that the athletes must conquer before the finish. I nervously passed the next few minutes making small talk with some of the other coaches while waiting for the cart to be seen again. As the cart came into view, a silence came over the crowd, not broken until Henry Chapman came into view. He had broken away from Jacob and a Kettle Moraine athlete and was heading for victory. Jacob was seen second later charging up the hill in second place, just a step ahead of third. Jacob and the Kettle Moraine boy hit the top of the hill almost tied. In a photo finish decided by just .03 seconds, Jacob had come out on top as he always seems to do. 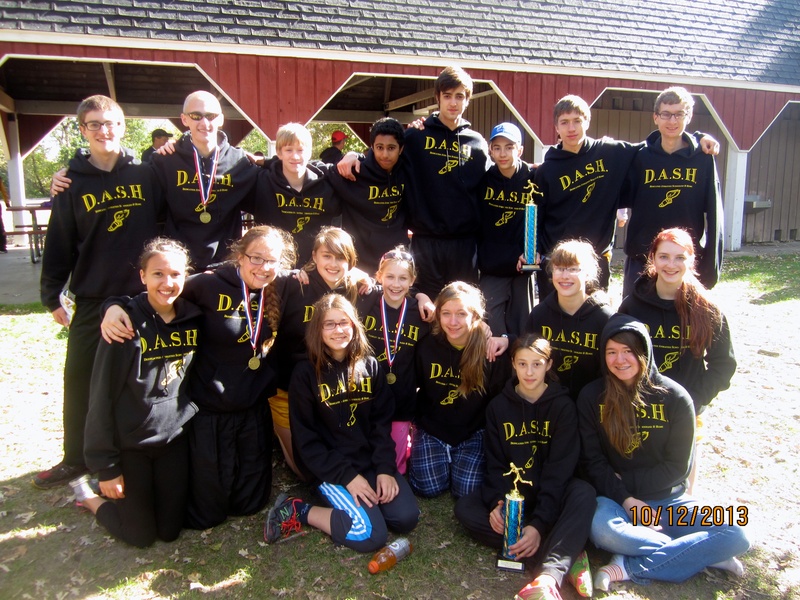 It was to be a spectacular 1-2 finish for the DASH team! A minute later Justin Chu was seen. Justin would end up in 20th place overall and make it to the medal stand. Joe Hughes ran much better this time out and looked like the runner we DASH fans have become accustomed to see. He posted a respectable 19:29 time. John Sherman is coming off of an ankle injury and was running with us the first time this year. John came through for us as our 5th runner. He will be getting his time down as the weather cools and his ankle strengthens up a little more. John Kowalinski had a great finish, moving up to 6th on the team with a nice 20:31 time. Drake Hacker was feeling the effects of a cold, yet came in just a few seconds after John. Tim Kowalinski also ran very well, posting a 20:41 time as our 8th runner in. Joe Maurer moved up late in the race to be our next runner in, with Samuel Zinkgraf right behind. Samuel ran much easier this time out. Let’s hope his back issues are behind him. We had three more athletes finish in under 22 minutes. John Klaves ran a very even race and finished in 21:17. Ben Hughes cut several minutes off his time and stayed right behind John the whole way. John LaBonte finished in 21:48 as he continues to improve at the 5k distance. 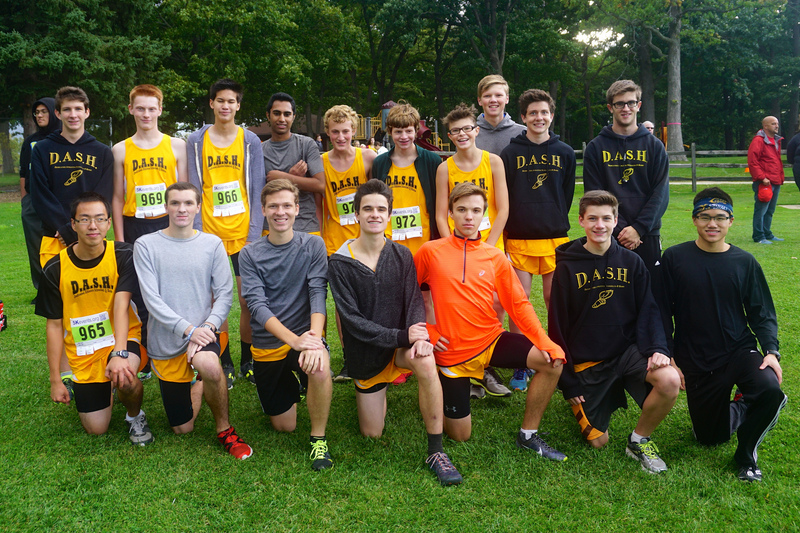 The team had 13 guys finish in 21:48 or less proving our depth. Joshua Anumolu put the timing system to the test. He tied both of his chips to one shoe. Would it record his time? The answer is no. Ben Fenelon is really improving. He is in racing mode now and was able to cut off well over a minute from his previous time. Will Farrell beat his time from the first meet. He is running well, and will be lowering his times as the weather cools. Joshua Schaber finished his first 5k race on the tough course. He is talented and just needs to keep gaining more experience. Overall the boys had about a great a day as anyone dared hope for. The sun came out for our girls, who were all entered into the smaller 4k race. Kayla Bruton got out fast and held the lead for awhile. Abby Chu worked her way up to run with Kayla for most of the race, including the big hill at the end. Kayla ended up ahead in the end, with both girls earning medals in the award ceremony. Faith Caspers ran much better, but is still a little timid at the start. She held on for 12th place overall. Jessy Homa really looked good this time out, and gave us a 16th place showing. Katrina Lipski finished with a nice 23:59 time. Her hard work is paying off. Zipporah Caspers decided to get her bad race out of the way. If she can stay healthy she will be helping us soon. There was a mixup in the times for the boys that I was able to correct. When the scores were finally tallied our boys had placed 6th overall, just a point out of 5th. Only the really big teams were ahead of us, and not by much. Our 119 team points were less than half of the 270 points Catholic Memorial tallied to take 7th. We have put a scare into the teams we will be facing later in the year. The girls finished 2nd by just two points in the 4k standings. It was good to see them having such a good showing despite not having their top two runners from the first race competing this time. The day was too much fun. I want to see this team run again soon. Friday seems a long way off. Thanks to all the DASH fans who stayed until the end to see the awards ceremony. 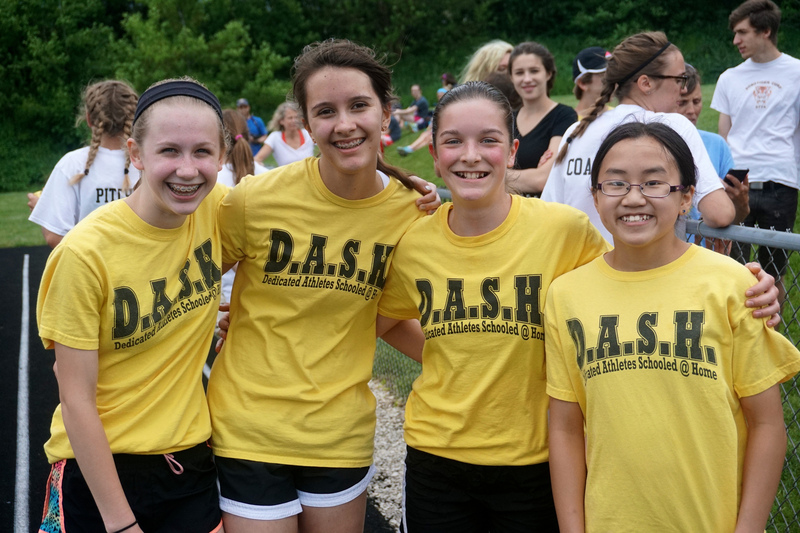 It is always special to hear loud DASH cheering for our athletes who are going up to collect their awards. Thanks to the Dickman’s who always make sure we are all taken care of before, during, and after the race. Thanks to Heather LaBonte for collecting the boys chips for me. Thanks to Grace Zinkgraf for again taking some extraordinary photos that really captured the moment. Now we need to get a little rest, but not too much. The season will be passing us by fast. We have to stay ready.